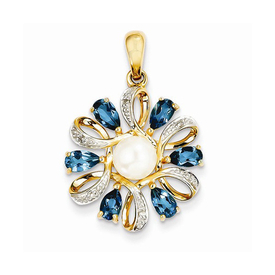 Lovely 14k gold Pearl, Blue Topaz and Diamond pendants. This pendant measures 20mm across and when measures with the bail, 28mm. Pear shaped Blue Topaz circle a center freshwater cultured pearl and diamond create a little flash. 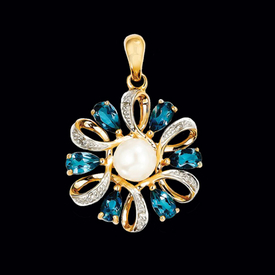 A very pretty pendant.